Exceptional Pair of Antique Thai Gilded Wooden Temple doors depicting mythological and forest animals including Garudas and Nagas. 19th Century. Rare, good condition. Size: 240 cm. x 120 cm. Suitable for Interior Design. STRONG IMPACT! Exceptional Pair of Antique Thai Gilded Temple Wooden Doors, 19th Century. Rare. Size: 240 cm. x 120 cm. Good condition. Suitable for Interior Design, STRONG IMPACT! 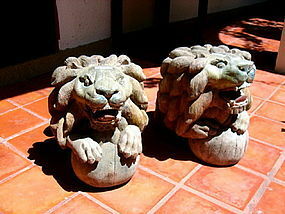 Rare MANDALAY Pair of hand carved solid wooden Lions, 19th Century, with some remains of original pigment. 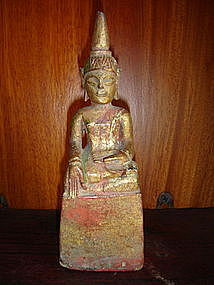 Excellent decorative showpieces for house entrance, hall, besides a fireplace etc. or suitable as a base for a coffee table with a glass top! Good condition showing natural aged patina. Size: L. 50 cm. x W. 37 cm. 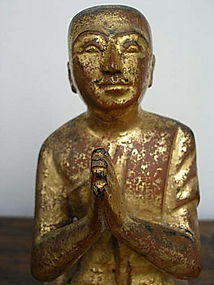 x H. 30 cm. Very difficult to find a matching pair like these. 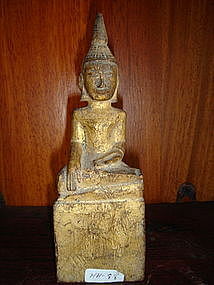 Lanna Thai Gilt Wooden Buddha Sculpture, 19th Cent. 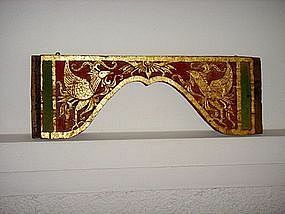 Striking Carved Wooden Headboard mounted 19th Cent. 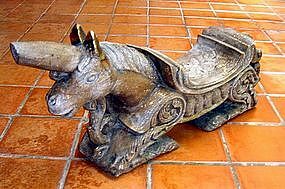 Unicorn Coconut Grater, Teak hand carved, 19th Cent.